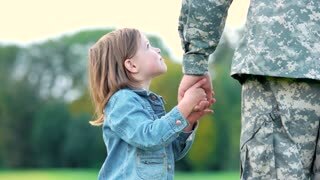 Hands of military father and his daughter. Hands playing of daddy and little girl. Father playing with his daughter in garden. Little girl playing with father's hand. Daugther of soldier military daddy. Father and daughter playing circling around at the park. Daddy soldier playing with little daughter in the sunny lawn at the day. Daddy meet his daughter. 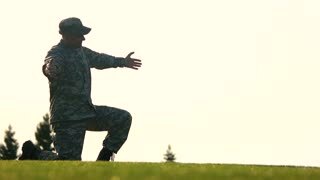 Military father waiting for his daughter staying in one knee. Happy asian father holding hands of his giggling little daughter and spinning her in circle in park against blue sky background. Cheerful dad playing with his lovely preschool girl outdoors.